...they'll ignore it at best, get insulted at worst. A short private message thingy I got on Zeitgeist Bewegung told me to basically be more in support of the movement and logically explain myself to PJ, so we could all form a happy couple or something. - Stop generating traffic through Z1, it's badly targeted traffic. You need open minded but skeptic people to run a social movement for SCIENCE, not some guys who believe any crap some guy with nice music tells them. - Don't promote ONLY TVP, but try to present numerous alternatives to the current socioeconomic climate. - Start looking for actual scientists, and use an actual project planning system instead of a online forum. Even basecamp is better than that. I went into a couple viral & basic online marketing strategies, basically I lot of stuff I was thinking TZM was going to do when I joined. Now, I get as a response (slightly rephrased): "Ur too critical, PJ is doing a good job and he will not have time to do all of that. We should start with one thing as many members have ideas and we cant act on all of them"
I'm kinda getting pissed at these people, as well as at myself for not knowing better. Give them a few easy things to fix their stuff and they'll find sth to complain about. Damn these global revolutions. They take up so much time. When is Merola going to have time to sit in his NYC apartment and get stoned? 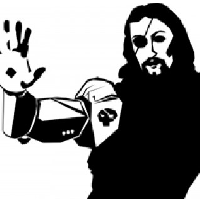 I'm surprised CyborgJesus hasn't been banned yet. Perhaps TZM just needs to make wind bells. I've been pissed at them for a while now, because they promote conspiracy theories and then pretend they don't. At least David Icke and Alex Jones don't try to hide that they're promoting conspiracy thinking. I never thought Jesus and I would be on the same page. I was like OMG THE ILLUMINATI DELETED THIS THREAD! But it just got sticked. "I was like OMG THE ILLUMINATI DELETED THIS THREAD!" The funny thing to me is that the response just fails on so many levels. They don't have the time to work for a few days, PJ isn't the leader but he must decide whether he likes my ideas, yadayada. Bumping this topic giving last chance to post on it before it goes off the front page; removing it from sticky. I'll keep it sticky within the TZM category, however.